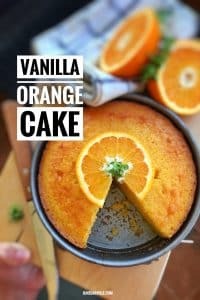 Orange Cake Recipe with Vanilla | Simple. Tasty. Good. I stumbled upon a wonderful orange cake recipe while on a trip in Greece. The cake I ordered was so incredibly moist and sugary but also light and fluffy at the same time. The natural flavor of the orange was so overwhelming because a good deal of orange zest was incorporated into the cake batter. I decided there and then to start a baking experiment at home even though I’m a notorious cake dummy. But before we head over to the recipe, please watch my video of how I’m preparing a superb vanilla and orange cake recipe in my fabulous KitchenAid Stand Mixer Mini! So then I thought that there has to be one good secret behind every good cake. One that I haven’t discovered thought because my cakes always turn out extremely dry, volcano shaped and terribly blackened on the sides but still raw and runny in the middle. Strange because ready-made batters from my local supermarket do succeed in my kitchen! But it’s about time I make 1 good old school cake in my life then. And guess what, I think I found the perfect recipe at last. I prepared this cake in my fabulous KitchenAid Stand Mixer Mini. If you don’t have a stand mixer, combine all the ingredients in a large mixing bowl until you end up with a fairly runny batter, then pour it in a buttered springform pan and bake the cake until it is fully set and cooked in the middle. Love cakes? Then also check out this cake recipe I’m very fond of: my almond cake with honey and yogurt! Watch my video of how I'm preparing a superb vanilla and orange cake in my fabulous KitchenAid Stand Mixer Mini! First off: add the soft butter, the sugar and the egg whites to the bowl of the KitchenAid Stand Mixer Mini. Attach the wire whip. Lower the mixer head. Then set the speed at 4 and mix the ingredients for 2 minutes until pale and airy. Adjust the speed to 6 and whip the ingredients for 3 more minutes. Then add the self-raising flour, the orange zest and juice, a pinch of salt, the vanilla extract and the egg yolks to the mixing bowl. Mix the ingredients at speed 4 for 2 minutes. Then adjust the speed to 6 and whip the ingredients for 3 more minutes. Remove the wire whip. Pour the cake batter in a buttered springform pan of 6-inches (15 cm) in diameter. Bake the orange cake in a preheated oven at 338°F (170°C) for 45 minutes until set in the middle. Then remove the cake from the oven and let it cool down fully in its tin. Cut the cake into wedges and serve. Hi, can you please write how large the springform is? How many cm in diameter?